* JWF: The Pride are riding a 12-game winning streak, and that's been primarily due to the unbelievable play of Wright-Foreman. JWF ranks 3rd in the nation in scoring (26.9 ppg) and has an even bigger edge in the CAA rankings, where he sits # 1. He is an efficient scorer both inside and outside, while still being # 2 on the team in assists. The Pride are # 1 in the CAA in scoring in CAA-only games (84.4 ppg) in large part due to JWF. Wright-Foreman would be a scary player to have to face should the Pride convert their performance to date into an NCAA Tournament appearance. * Perimeter Defense: Not only are the Pride # 1 in the CAA in three-point shooting (.398), they are also # 1 in three-point defense (.308). Having big, athletic guards is probably the biggest reason for their success in this area. It doesn't hurt to have a veteran lineup either; Hofstra sports two grad transfers, 2 seniors and 2 juniors in their top 7 of the rotation. * Free Throw Shooting: Hofstra has been able to win so many close contests, including a 3-OT game with W&M and 3-point wins over Northeastern and Elon, in large part because of their superb shooting at the stripe. At .786 and ranking 2nd in the CAA, you'd better have a lead late on the Pride, because trying to extend the game with fouls won't work out well. * Depth: As is typical for a Joe Mihalich-led team, Hofstra relies heavily on its starting 5. Wright-Foreman has played 200 of 215 available minutes (40.0 mpg) in CAA play, and Pemberton has logged 37.6 mpg. Those 2 are in the top 3 in the CAA in minutes in CAA-only games. Buie also ranks in the top 10, at 35.2. 6th man, Ray, and backup big man Dwyer have shown enough to keep at least 2 of the starting spots relatively fresh, but this is something that could come back to bite the Pride late in the season or in the CAA Tournament, as it has in the past. For now, however, Hofstra is rolling. * Defensive Rebounding: The one area where Hofstra is susceptible is protecting against offensive boards and putbacks. Ranking 8th in defensive rebounding (34.8 rpg) despite the # 1 field goal % defense (.412) is a signal that crashing the boards is a crucial part of the strategy of beating them. Running with a 4-guard lineup is what makes Hofstra a bit exposed on the glass, so this is an area where the Seahawks, who are # 1 in the CAA in Offensive Boards (39.6 rpg), can gain an edge with their trio of bigs and rebounding guards. Sadly, I'll be on an a plane back form Cali and have to miss this one. Hopefully we show up with the energy and game plan form yesterday. With their 3 pt shooting #s that could create a big problem for us. A big takeaway is this is not the same Hofstra team we beat in the CAA Tournament last season. They’ve flooded the court with talent after adding 2 grad transfers and the St Bonaventure transfer into the mix. Once again, a press could be a difference maker. We have a DEEP bench and could tire them out by making them work to get the ball up the court and maybe force some high turnovers for easy points. Hofstra really has a good offensive team this year. They're looking like the CAA favorite right now. Hopefully the Hawks can give them them a good game. Buie and Wright-Foreman give them that senior backcourt that can do things. Maybe this is the Pride's year because they sure are due after having so many good teams over the years and not getting to the Promised Land. That's wrong. He's played 200 CAA minutes, but Hofstra played 215 including triple overtime. He played 29 vs. Delaware in a win by 45, 38 vs. Drexel, 40 vs. Northeastern, 55 vs. William & Mary, and 38 vs. Elon. In all games, Pemberton has gotten worse at shooting threes and is at .339 (he shot them .409 last season). Wright-Foreman, Buie, Coburn, and Ray all shoot threes at least .383. In all games, Buie is one of two Division I players averaging at least 5 assists, at least 2 steals, and at most 2 turnovers. Oh yeah, we get a full dose of EvanJ this week! (01-15-2019 11:24 AM)Gary Miller Wrote: Oh yeah, we get a full dose of EvanJ this week! Am I annoying? It's not just people on message boards who I correct. I correct the AP and bloggers including at least one who is a journalist. The AP wrote "Charlotte" instead of "Charleston." There are so many mistakes in many places online that could have been looked up in a few seconds. (01-15-2019 09:22 PM)EvanJ Wrote: Am I annoying? It's not just people on message boards who I correct. I correct the AP and bloggers including at least one who is a journalist. The AP wrote "Charlotte" instead of "Charleston." There are so many mistakes in many places online that could have been looked up in a few seconds. EvanJ is adorable. Your lack of filter is refreshing. Go Hawks! I have to search online articles and message boards where someone proofs Evan J and corrects something he had wrong. 1. UNCW will not be able to solve the Pride's matchup zone defense and it's impeccable rotations. Cacock will be bottled up and not touch the ball and the Hawks will not cut and move the ball quickly but rather run a 'zone' offense which is the death knell versus a matchup. 2. Once again it will rain 3s from the heavens and we will will say, "They made tough shots versus a hand up." 3. JWF will go for a career night. Keep in mind he has 8 of the top 10 scoring games this year in the CAA. 4. Toews will get his double digit assists. Keep in mind he has 8 of the top 10 assist games this year in the CAA. Besides Delaware , Hofstra has played close games in the CAA with William and Mary, NU and Elon. And they beat Drexel by 14. William and Mary plays a 3-2 zone, just like Hofstra. Will be interesting to see in game adjustments if we get behind. Irony is not lost on you 82Hawk. Other than all that, Mrs. Lincoln, how was the play? WILMINGTON, North Carolina – Coach C.B. McGrath and the UNCW men's basketball team head back on the Colonial Athletic Association trail this week with a pair of challenging road games in the frigid Northeast. 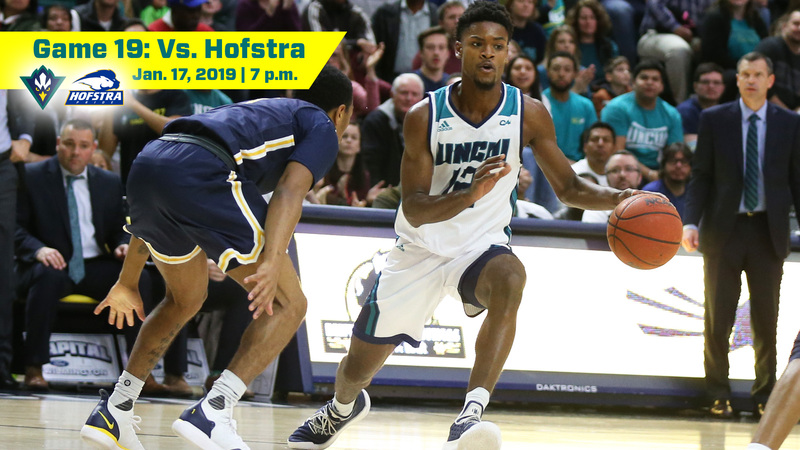 UNCW (7-11, 3-2) takes on Hofstra (15-3, 5-0) in the first leg of the journey on Thursday night in Hempstead, N.Y. The Seahawks and Pride are meeting for the 41st time since Hofstra joined the CAA in the 2001-02 season. Live Seahawk Digital Network (SDN) coverage of Thursday's contest begins at 6:45 p.m. from Hempstead, N.Y., with Mike Vaccaro, the "Voice of the Seahawks," on the call. Visit UNCWsports.com/SDN for live audio and video coverage. Following the matchup with the Pride, the Seahawks move up to Boston for a 4 p.m. Saturday game with Northeastern (9-8, 3-2) at historic Matthews Arena. "Both teams this weekend are great teams," said C.B. McGrath, UNCW's second-year head coach. "They have great coaches and rosters with a lot of experience on them. Hofstra's had a couple close games and has made the plays at the end. They haven't let any opportunities slip by. "Going on the road is never easy. It's a daunting task, but our guys are looking forward to it. We made the plays we needed to at JMU and Towson and hopefully that confidence will continue." The Seahawks are seeking for their third straight road victory after notching pair of wins at JMU and Towson two weeks ago. In its last appearance, UNCW outscored Drexel by 16 points in the second half and senior forward Devontae Cacok became UNCW's career rebound leader in a convincing 97-83 victory over Drexel on Saturday at Trask Coliseum. Cacok, one three players with 20+ points, finished with his fifth straight double-double (24 points | 12 rebounds) as the Seahawks shot 50 percent from the floor and scored 54 points off the bench in posting their first conference home win of the campaign. Cacok, from Riverdale, Ga., continues to stand out in the NCAA's weekly stats. He leads the nation in double-doubles, ranks second in total rebounds and stands fifth in rebounds per game and offensive rebounds per game. Cacok appears in his 115th game for the Seahawks on Thursday and his UNCW career numbers are impressive. He has scored 1,362 points (7th all-time) and snared 1,067 rebounds (1st all-time) with 47 double-doubles (2nd all-time). He has shot 65.3 percent from the floor, blocked 80 shots and snagged 97 steals over the last four seasons. Picked to finish third in the CAA race, Hofstra is off to a torrid start, carrying a 12-game winning streak into the contest. The Pride sits alone atop the CAA race and has not been beaten in 10 outings at the Mack Sports Complex this season. Powered by senior shooting guard Justin Wright-Foreman, who has reached double figures in 71 straight games, the Pride features the CAA's top scoring offense (81.9 ppg). Wright-Foreman, the nation's third leading scorer at 26.9 points per game, has been named or shared the CAA's Player-of-the-Week honor five times this season. He is shooting a robust 50.3 percent from the floor and 87.0 percent at the free throw line. He's also been deadly behind the arc, converting 51-of-128 treys for 39.8 percent. "Justin Wright-Foreman has supreme confidence," McGrath continued, "and everyone on his team knows he's going to make a play at the end if they need it." In the last clash of the two teams, UNCW playmaker Jordon Talley matched the best individual performance in conference tournament history with 37 points to lift No. 6 UNCW past No. 3 Hofstra, 93-88, in the final quarterfinal game of the 2018 CAA Championship on March 5, 2018, at the North Charleston Coliseum. The crafty Talley equaled the tournament scoring record set by William & Mary's Marcus Thornton in the 2015 semifinals against Hofstra. THE SERIES: UNCW and HU lock horns for the 41st time since Hofstra joined the CAA. The Seahawks own a slim 21-19 edge in the series. ON THE HORIZON: The Seahawks have just 13 games remaining in the regular season - six at home and seven on the road. UNCW plays five of its final seven games away from Trask Coliseum. KAI TIME: Freshman point guard Kai Toews continues to enjoy an outstanding rookie season. He ranks third among all NCAA Division I players with 7.9 assists per game, trailing only Ja Morant of Murray State (10.7) and Alex Robinson of TCU (8.1). The Tokyo native has registered four double-doubles this season. NEXT UP: Following Thursday's tilt, the Seahawks shoot up to Boston for a 4 p.m. matchup on Saturday against Northeastern at historic Matthews Arena. (01-15-2019 10:59 PM)geewizNU Wrote: I have to search online articles and message boards where someone proofs Evan J and corrects something he had wrong. Yeah, agree. He tends to keep a lot of the homerism stats in check too. EvanJ certainly has a role on the boards and plays it well.